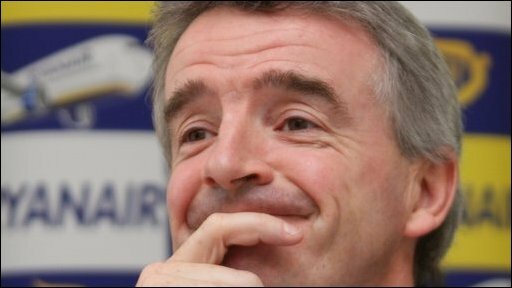 BBC News - Ryanair boss Michael O'Leary says expenses "not fair"
Ryanair boss Michael O'Leary says expenses "not fair"
Ryanair, Europe's largest low-cost carrier, has cancelled all flights to and from northern Europe until at least mid-Wednesday because of the ash cloud. The airline's CEO, Michael O'Leary, has said he is "nervous" about the airlines who are seeking compensation because of the volcano. He also said that passengers seeking expenses in such extraordinary circumstances is "ludicrous."